DAN FURMANSKY: Democratic Members of Congress, Clergy Arrested in Civil Disobedience for Immigration Reform; CASA’s Gustavo Torres Taken Into Custody; Maryland Rabbi Leads “Prayer-In” at Eric Cantor’s Office; More than 1,000 still being deported every day. 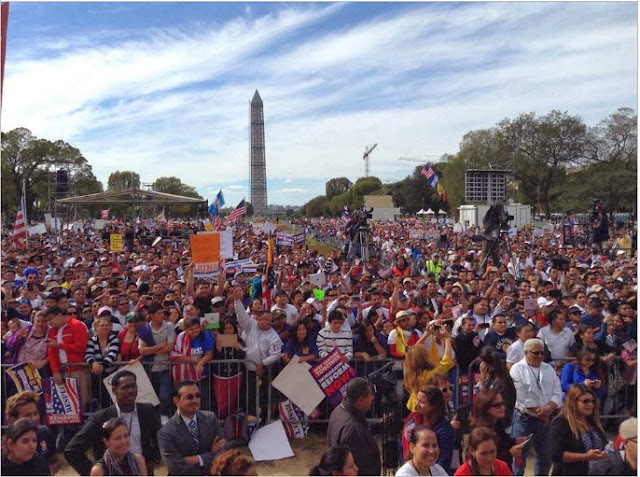 Approximately 15,000 people converged on the national mall today and marched to the Capitol building to call attention to stalled immigration reform legislation. No surprise that the soulless Republican majority in the House of Representatives has refused to move the bill passed by the Senate, even with its broad bipartisan support. They’re too busy snatching food assistance from hungry Americans and trying to get the Supreme Court to strike down individual aggregate contribution limits so they can ensure that the wealthy have an even greater say over who gets elected in this country. Rep. John Lewis once again proves why he is social justice legend. 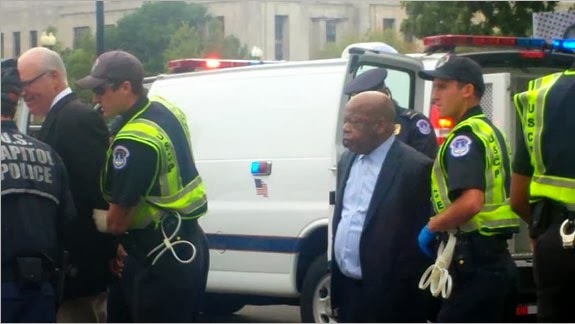 According to his office, it is at least the 45th time he has been arrested—40 times during the civil rights movement alone and 5 times as a member of Congress. According to ABC News, Gutierrez pledged in a speech to “lock arms with my colleagues and go to jail today for the father who was deported and cannot see his children, see them grow up, and see them prosper in the United States, the country of their birth. HUFFINGTON POST: Several Republicans turned out for the rally as well. Rep. Mario Diaz-Balart (R-Fla.), a long-time supporter of reform and the only GOP member of a bipartisan working group on immigration who didn't quit, appeared on stage, along with Reps. David Valadao (R-Calif.), Jeff Denham (R-Calif.) and Ileana Ros-Lehtinen (R-Fla.). They did not participate in the protest later in the afternoon. Apparently they didn’t want to get their hands too dirty. Our own Gustavo Torres, head of Casa de Maryland, was also taken into custody. So were countless faith leaders, including my old boss, the Rev. Peter Morales, president of the Unitarian Universalist Association, who was also arrested in Phoenix during our protest of SB1070. “Our laws are more than broken, they’re evil,” he said today. Also arrested was Rabbi Jason Kimmelman-Block, of Silver Spring, who addressed the crowd on the Mall and led others in prayer at the office of Representative Eric Cantor, the only Jewish leader in the House Republican caucus. 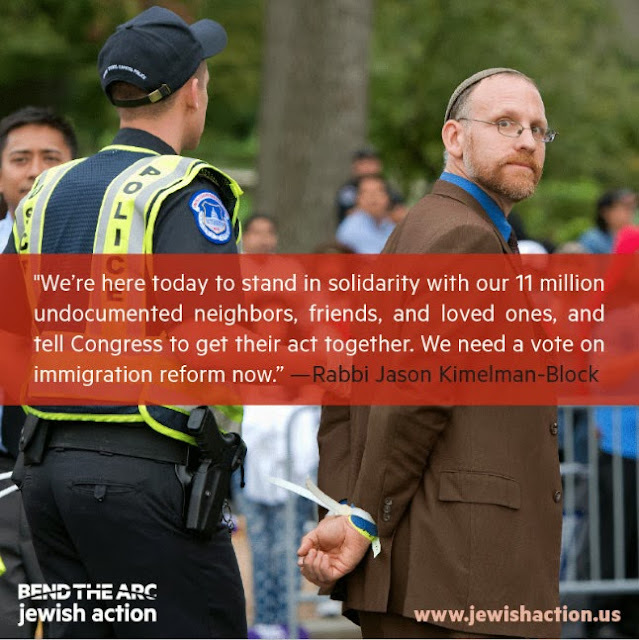 Rabbi Kimmel-Block, a father of four, is the rabbi-in-residence for the great advocacy group Bend the Arc: A Jewish Partnership for Justice. As we Jews say when someone performs a mitzvah, or good deed, Yasher koach, Rabbi. President Obama does have the power to halt deportations until the Republicans take meaningful action for immigration reform. But he won’t do it without real pressure from the Democratic Party. Activists are more than impatient with the President for failing to make a real difference. so far, only one Maryland Congressperson has had the gumption to ask the President to stop separating families - Rep. John Delaney. As we march towards the last sad breaths of this Congressional term, if inaction continues in the House of Representatives as expected, it will be long overdue for Maryland’s Democratic leaders to step up to the plate and let our president know that we expect him to do everything in his power to make lives better for immigrants and immigrant families.